Today’s agenda consisted of running errands around town on foot in blustery, cold, misty weather. Having worked this morning I was pressed for time in getting things done and didn’t want to take the time to wash and fuss with my hair. The solution for warmth, style and manageability was a hat. Luckily, I’ve about a dozen of them. From woolly caps to structured hats, I’m literally covered for every outing. And no matter if it’s summer or winter, I find a reason to wear a hat and, more often than not, that gets comments. And today was no exception. About half a dozen women commented on my hat (not the one shown above – that’s about 6 years old). Each time they say the same: they love the hat, they wish they wore them more or could pull it off. The last part always gets me. There’s this idea I’ve found across America that women feel they can’t really wear hats – that they’re theatrical, not appropriate, or young. Unless they’re baseball caps or visor, I don’t really see many women here wearing them. When I’m wearing a hat in Europe, however, my hats aren’t a conversational piece at all as everyone there seems to wear one and I just blend right in. Maybe it’s because women there tend to be more pedestrian oriented than their American counterparts; when you’re out in weather especially, you need something that is warm, that keeps your hair from flying all over and styled. In America, more women drive from place to place and a hat becomes less a necessity and more of a fashion accessory. And it seems as though that’s a style that doesn’t seem to be in fashion. I wish it was as I have quite a few hats that I like to wear depending on the outfit, the weather, and the need. I’ve dressy ones, casual ones, practical and fun.My ginourmous sun hat that borderlines obnoxious but I wear it to the beach or out to a casual summer lunch when the rays are harsh or I’m feeling dramatic amongst my girlfriends. 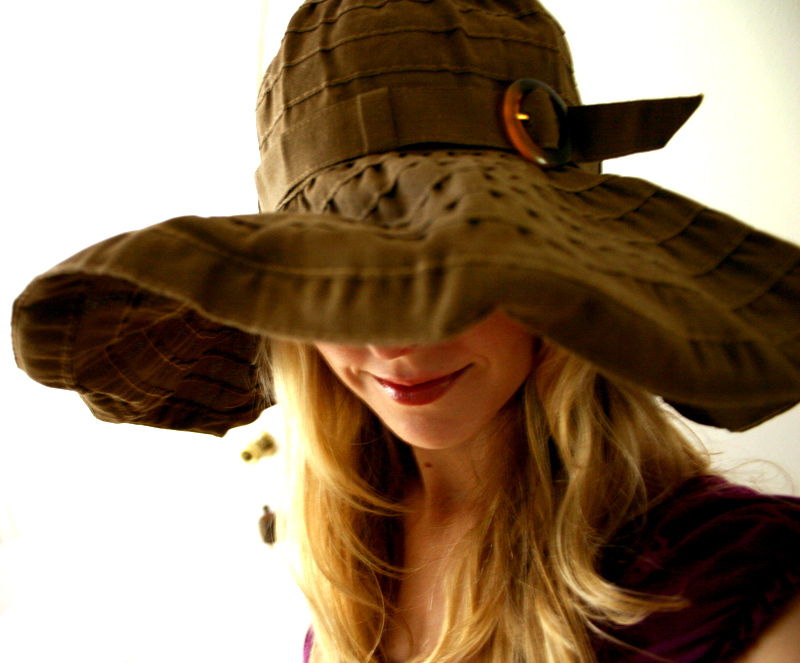 I have a simple sun hat for walks about town and a more practical sun blocker for longer walks during the day. I have so many woolly caps for warmth and bad hair days and a couple of pretty rain caps for an evening out. There’s hope, however, as over the years I’ve been seeing more hats in shops from Anthropologie, Nordstrom, Urban Outfitters, JCrew and on Etsy. So perhaps hats will start trending more stateside because they’re not just pretty, they’re practical. PS: I’m still trying to find the best way to store my hats. Wool ones go in bins but my harder ones that need to keep their shape need boxes and I’m still searching for those elusive round bins. Any ideas? I would say the same thing for men in America – at least, men under 50 yrs old (the one exception being west-coast hipsters who wear their little bike caps and ride fixies :)). I wear a wool driving cap almost every day, and have a nice felt fedora, and a couple of other hats that I wear on a pretty regular basis. They do look great, and they do serve the very practical purpose of keeping my head warm and dry in the fall/winter/spring and keeping the sun off of it in the summer – as I go most places by bicycle or walking. I think similarly, bicycles have become sort of fashion or lifestyle accessories as well, since almost everyone here (America) owns at least one car and uses it for basically all their transportation. Bicycles here aren’t seen as just tools to get you from one place to the next as they are in many places in Europe (Denmark included), they must be some kind of statement or whatever. I saw some glorious round hat boxes on etsy the other day. That would be my best guess for finding those.